Empire Builder® offers one of the most majestic routes in the Amtrak system. 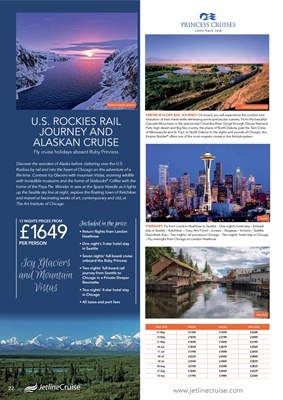 Discover the wonders of Alaska before clattering over the U.S.
ship in Seattle - Ketchikan - Tracy Arm Fjord - Juneau - Skagway - Victoria - Seattle. - Fly overnight from Chicago to London Heathrow.